Loons are found on freshwater lakes throughout Canada and parts of the northern US during the summer breeding season. Unmated loons as well as juveniles (which are too young to breed) can be found on salt water during this same season. As winter approaches, loons migrate to Pacific and Atlantic coasts. Maine loons have short migratory routes, spending winters along the Maine coast, while loons that breed in the central US migrate to the Gulf of Mexico. Most people in Maine are very familiar with the wail of the Common Loon from across a lake. The loon is a beloved symbol of the natural beauty and wildlife of Maine, and it even appears on one of our license plates. 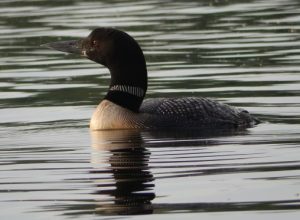 After reaching record low numbers in the 1970s, organizations such as Maine Audubon, and volunteers across the state have worked to monitor the loon population and advocate for their protection against threats such as human disturbance of nesting sites, degraded water quality, boat traffic, and lead poisoning from discarded lead-based fishing tackle. Recent data indicates that adult populations in Maine have been increasing since the early 1990s. 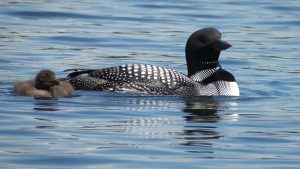 Signs of the Seasons observers are contributing phenology data to monitor for possible changes in the timing of loons’ annual life cycle events in response to climate change. 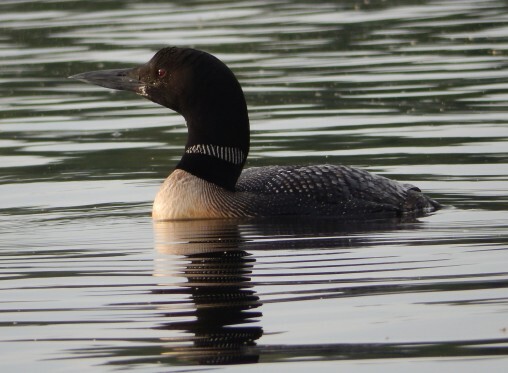 Appearance: An adult loon can be up to 28 inches long, with a wing span of 50 inches, and can weigh up to 14 pounds. A breeding adult has a distinctive black and white pattern on its back and wings, a band of white, a shiny black head and bill, and a red eye. In the winter, adult loons have a duller appearance, with a dark gray back and a white throat and chest. The Common Loon is a true water bird. With solid bones and large muscles, they are talented swimmers and divers, but are not very efficient at flying or walking on land. Their diet consists primarily of small fish, which they catch and swallow while on underwater dives. An adult may consume two pounds of fish per day. They also consume crayfish, insects, crabs and snails. 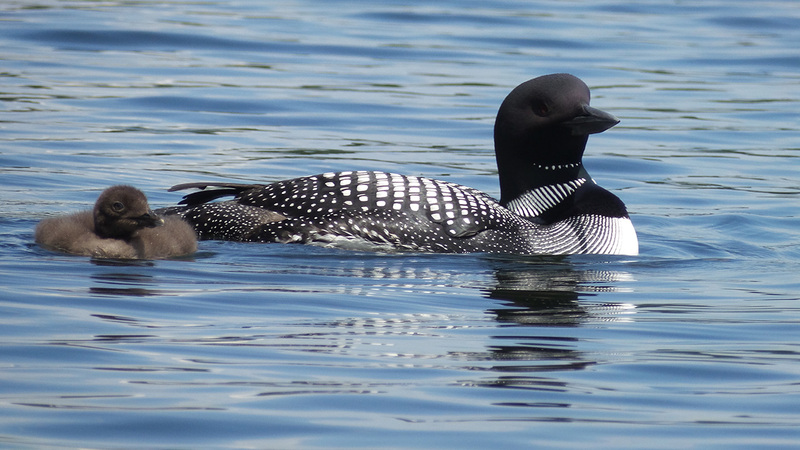 Life History: The Common Loon chooses large, clear lakes with rocky shorelines for nesting. Awkward on land, they come ashore only for mating and nesting. Nests are usually very close to the shore. The female usually lays two eggs in May or June, and both parents incubate them for about four weeks until they hatch. Chicks leave the nest after just one day, but parents continue to take care of them for about three months. Loon chicks can swim almost immediately and dive about a week after birth, but they often take rides on the backs of their parents. Newly-hatched loons are fed by their parents for about six weeks. By 11 or 12 weeks they can fish and fly on their own. At the end of summer, loon parents leave their offspring and fly separately to different coastal areas to overwinter, reuniting as a pair in the spring. Juveniles also migrate to coastal locations, where they remain for several years until they are ready to return to a lake environment for breeding.